Making It Work! How to Effectively Navigate Maternity Leave Career Transitions: An Employee’s Guide was developed for women taking a maternity leave, which is inclusive of maternity, parental and adoption leave, and equally applicable to women who are experiencing their first or subsequent maternity leave career transition. This user-friendly resource is meant to be a self-directed tool that you use to tailor specific strategies to your career needs. It will empower you to be an active agent in your career development, setting yourself up for success. Women make up approximately 50% of Canada’s labour force and account for 58% of post-secondary graduates. Of the working women who do become mothers, 90% will take a maternity leave. However, 36% of new mothers feel that taking maternity leave negatively impacts their opportunity for promotions, career development and career progression. The information in this guide serves as a starting point to develop positive career management practices not only in navigating your maternity leave, but with other career decisions in the future. Written by a team of workplace psychologists and career development experts at Canada Career Counselling and published by CERIC, the goal of this guidebook, along with the employer version (Making It Work! How to Effectively Manage Maternity Leave Career Transitions: An Employer’s Guide) is to help working mothers and organizations to collaboratively realize their full potential. What has long been a taboo topic between employer and employee, and an often angst ridden journey for expectant mothers and employers alike, now for the first time has a playbook. Not only that, it hits on every note. You need not look any further for how to handle a maternity leave, and run your human capital, with the best information out there. This is progress. After reading through the guidebook, I wish I could have read this before I went through my own maternity leaves a few years ago. 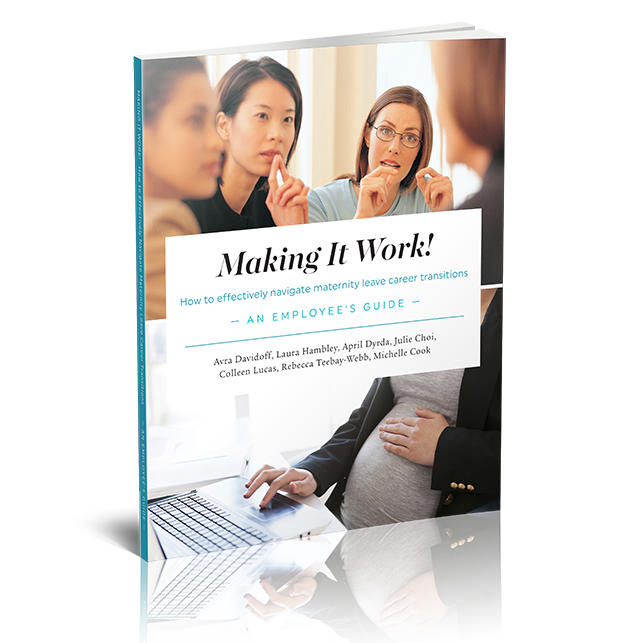 It’s a well-researched, well-written guide not only for employers to consider but also for women taking maternity leave. This is an excellent resource for any leave, not just maternity leave. The helpful checklists and definitions are going to provide much needed support for any organization hoping to do better in how maternity leaves, or any leave, is managed.